Month-to-Month. NO Contracts. NO Hidden Fees. Remember: we’re so confident that you’ll love having $99 Social manage your social media marketing, we’re protecting your decision to partner with us by a 14-Day Money Back Guarantee*. If at any time in the next 14 days you decide your investment wasn’t worth it, just let us know and we’ll refund every penny of your purchase. You risk absolutely nothing, so click the “Add To Cart” button now to get started with the best social media posts! Years of experience in social media marketing has taught us how to strike just the right balance of self-promotion on social media. We’ll strategically post links on your social media pages to get people clicking through to your site to learn more about your offers. Connect us to your Facebook page. This Terms of Service Agreement (the “Agreement”) sets forth the terms and conditions on which you (the “Client”) has engaged $99 Social to perform certain Services as outlined herein. This is a legally binding agreement between you and $99 Social. By becoming a $99 Social Client, you agree to be legally bound by the terms and conditions set forth in this Agreement. The “Effective Date” of this Agreement shall be the date on which you submit your order for Services to $99 Social. 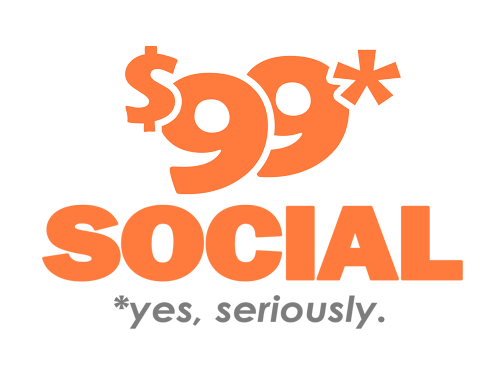 $99 Social will provide the Services to Client as outlined on the $99 Social website (www.99dollarsocial.com). 2.1 $99 Social will provide Services to Client in accordance with $99 Social`s standard policies and procedures. $99 Social reserves the right to reject Clients for any other reason, in $99 Social`s sole discretion. $99 Social will be responsible for all aspects of providing the Services. 2.2 All $99 Social rules, policies and operating procedures concerning privacy, pricing, customer service, and all other aspects of the Services will apply, and $99 Social may change its rules, policies and operating procedures from time to time in its sole discretion. 3.2 Initial charges for service will be paid in advance of service. 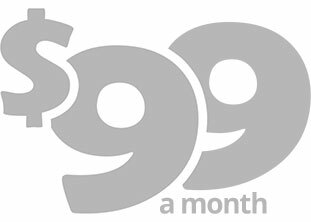 Thereafter, $99 Social will attempt to charge Client’s credit card on the monthly anniversary date of the client first ordering services. Charges not paid by the due date for any reason will result in a suspension of Services until full payment is received. Suspension of Services for non-payment will not result in a proration of fees. 3.3 Except in the case of a material breach of this agreement by $99 Social, $99 Social does not issue refunds of any fees for any reason. $99 SOCIAL EXPRESSLY DISCLAIMS ANY AND ALL WARRANTIES REGARDING OR RELATED TO THIS AGREEMENT, THE SERVICES OR ANY MATERIALS OR ASSISTANCE PROVIDED TO CLIENT, EXPRESS OR IMPLIED, INCLUDING WITHOUT LIMITATION THE WARRANTIES OF MERCHANTABILITY, COURSE OF PERFORMANCE OR DEALING, TRADE PRACTICE, TITLE, NON-INFRINGEMENT, AND FITNESS FOR A PARTICULAR PURPOSE. Client will indemnify and hold harmless $99 Social and its customers, suppliers, directors, officers, agents and employees from and against any and all losses, costs, damages, liabilities and expenses (including, without limitation, reasonable attorneys` fees) arising out of or relating to any breach by Clients of any of the terms of this Agreement. $99 SOCIAL SHALL NOT BE LIABLE TO CLIENT OR ANY ENTITY OR PERSON CLAIMING THROUGH OR UNDER CLIENT FOR ANY LOSS OF PROFIT OR INCOME OR OTHER INDIRECT, CONSEQUENTIAL, INCIDENTAL, OR SPECIAL DAMAGES, WHETHER IN AN ACTION FOR CONTRACT OR TORT, IN CONNECTION WITH THIS AGREEMENT, EVEN IF $99 SOCIAL HAS BEEN ADVISED OF THE POSSIBILITY OF SUCH DAMAGES. IN NO EVENT SHALL $99 SOCIAL`S LIABILITY TO CLIENT HEREUNDER EXCEED THE AMOUNT PAID TO $99 SOCIAL BY CLIENT FOR THE PREVIOUS ONE (1) MONTH OF SERVICES. THIS LIMIT IS CUMULATIVE AND THE EXISTENCE OF MORE THAN ONE CLAIM WILL NOT ENLARGE THE LIMIT. CLIENT ACKNOWLEDGES THAT THESE LIMITATIONS OF LIABILITY ARE AN ESSENTIAL ELEMENT OF THE BARGAIN BETWEEN THE PARTIES AND IN THEIR ABSENCE THE TERMS AND CONDITIONS OF THIS AGREEMENT WOULD BE SUBSTANTIALLY DIFFERENT. This Agreement constitutes the entire understanding and agreement of the parties with respect to the subject matter hereof. This Agreement may be amended from time to time in $99 Social’s sole discretion. An email communication sent to Client’s last known email address will be deemed sufficient notice of any such changes in this Agreement. This Agreement shall be binding upon and inure to the benefit of the parties` successors and permitted assigns; provided however, that Client may not assign this Agreement, in whole or in part, without $99 Social`s prior written consent and any assignment by Client without such consent shall be null and void. This Agreement shall be governed by and interpreted in accordance with the laws of the state of Arizona without regard to its rules pertaining to conflict of laws. Any litigation or dispute resolution related to this Agreement shall take place in Maricopa County, Arizona, and the parties hereby consent to the jurisdiction of the state and federal courts located therein. Except as otherwise expressly set forth herein, any notice required or permitted to be given under this Agreement shall be sufficient if in writing, in the English language, and sent via U.S. Certified Mail, return receipt requested. If any provision of this Agreement shall be held by a court of competent jurisdiction to be unenforceable, that provision will be severed only to the extent minimally necessary, and the remaining provisions of this Agreement will remain in full force and effect. The waiver of any breach or default of this Agreement will not constitute a waiver of any subsequent breach or default, and will not act to amend or negate the rights of the waiving party.